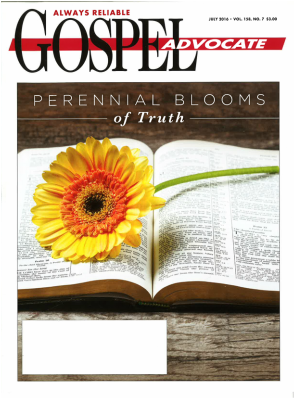 This article appeared originally in the July 2016 issue of Gospel Advocate. The Crusades are a topic of controversy and contention. Popular references today generally seem to portray them as wars of conquest borne from religious fanaticism. The mere use of the term “crusade” is enough to spark outrage. Voices in the media often leave little room for civilized discussion or debate. Popular culture is filled with common misperceptions and distortions of the events. United States Presidents both past and present have grossly distorted the relationship between Europeans and Muslims, painting it as a conflict between barbaric crusaders and enlightened Muslims. Ridley Scott’s 2005 film Kingdom of Heaven does the same, depicting the crusaders as barbaric and bloodthirsty and their Muslim opponents as noble and enlightened. Although scholars still debate fine points, quite a bit can be stated with certainty. Any discussion of Islam must begin with its sacred scriptures, the most important of which being the Qur’an. Allegedly revealed to Muhammad over a period of twenty-three years, this text is considered to be the eternal word of Allah. It is eternal in the sense that it existed in eternity in very much the same way as the opening verses of John’s Gospel depict Jesus. As some Islamic scholars have noted, if Christ is the Word of God made flesh (John 1:14), the Qur’an is the word of Allah made text. Contrary to popular claims that Islam is a religion of peace, the Qur’an tells a much different story. Numerous passages advocate violence in general (Sura 2:216; 4:76; 8:65; 9:38-39, 123; 88; 47:35), and are usually understood as prescriptive for modern Muslims. Other passages call for the destruction of infidels specifically (Sura 8:12, 39; 9:5, 30, 73; 66:9). This comes as no surprise, as the Qur’an clearly describes the superiority of Islam over all other religions (Sura 9:33; 48:28; 61:9), and therefore the superiority of Muslims over adherents of any other faith. Candid interviews by Muslim religious authorities across the world often bear witness to this fact. Modern attitudes toward the Crusades rarely take into account Islam’s self-professed incompatibility with other religions, cultures, and worldviews. Critics of the Crusades never ask the question, “How did Muslims come to possess the Holy Land in the first place?” Modern interpreters who blame poor relations with the Middle East on the Crusades almost always fail to examine the relationship between Islam and Europe in the four centuries prior to the First Crusade. Centuries before Pope Urban II called the First Crusade in 1095 to redress wrongs suffered by Jews and Christians, Muslim armies had invaded the Middle East, Asia Minor, North Africa, southern Italy, and most of Spain. By the end of the eleventh century, Muslim armies had captured more than half of the territory that had been occupied by Christendom. The historical record shows that non-Muslims were subjected to terrible treatment. Spain was a particularly beleaguered territory. Non-Muslims were required to pay the jizya, or “head-tax” imposed on Jews and Christians for the privilege of retaining their faith while living in Muslim territory. However, should even one person break a single law, protection for his entire community would be rescinded and everyone’s lives would be put at risk. Offenses included things as simple as leaving a cross or wine out in the open where it might be seen by a Muslim. Muslim aggression against Europeans is well documented. During the 700s, Muslim armies overran much of Spain. In the aftermath, non-Muslims paid crushing taxes and were treated with contempt as inferiors. Islamic forces and would have taken France as well if it had not been for Charles Martel’s military victories—most notably at the Battle of Tours in 732. Prior to the Crusades, pilgrims and monks in the Holy Land were tortured and murdered en masse in scenes reminiscent of televised ISIS executions. In the eleventh century, Caliph al-Hakim persecuted Christians, ordered the destruction of churches throughout Egypt and Palestine, and forced large numbers of Jews and Christians to convert or face execution. Those who condemn the crusades—and implicate Christianity in the process—often make three general arguments: the Crusades sought to plunder Muslim territories, Crusaders were guilty of inexcusable brutality, and the entire affair represented an attempt at European colonialism. We will examine each in turn. Critics often claim the Crusaders were looking for wealth. In fact, there was no real wealth to be had in the Middle East. Crusaders were well-to-do men in Europe who could easily impoverish themselves by participating in a Crusade. A wealthy lord might have to mortgage his land or even his castle in order to take part in what he considered a holy mission of liberation. Crusading was extremely expensive, and anyone who stayed in the Holy Land required sustaining funds. The Crusades did not seek wealth in Muslim territories; they often depleted their own finances back home. The Crusaders are often charged with conducting a scorched-earth campaign wherein they butchered every man, woman, and child they encountered. This is false, although modern readers must understand that the age of the Crusades was one in which war was exceedingly violent and had nothing resembling a modern Geneva Convention. If a city came under siege, it made a great deal of difference when the population chose to surrender. If they surrendered quickly, the inhabitants would be largely spared (with the exception of some cities in Egypt, in which Muslim leaders promised leniency and later butchered the population). If the city held out, common practice—regardless of whether the attacking army was Muslim or European—was to wreak vengeance upon the city. Although the Crusaders were slightly better than their Muslim counterparts in this regard, this merely explains their behavior and does not excuse it. If blame is to be assigned, it must be done without a double standard. Finally, many Muslim critics decry the Crusades as an attempt at European colonialism. They claim these efforts generated centuries of Muslim resentment and helped spark the violence and extremism found in the Middle East today. They are poor students of history. The Crusaders sought to reclaim lands that had been taken in Muslim invasions and made no effort to expand European rule. They allowed Muslims to live in peace without forcing them to convert to Christianity. After the First Crusade, most people went back home to the lives they had left behind in Europe, leaving only a very small force behind in Jerusalem and a few other cities. This argument is only about a century old. Muslims prior to the 20th century gave no evidence of any resentment over European colonialism. It has found a home in the discussion today because it is a powerful and emotional rallying point. Following the Crusades, Islamic military aggression against Europe continued as it had before. Muslim armies effectively dismantled the Byzantine Empire—the only buffer between Muslim territory and Europe—before Muhammad II finally conquered Constantinople in 1453. Suleiman the Magnificent stood at the gates of Vienna in 1529, and might have taken it had an unexpected rainstorm not forced him to leave his artillery behind. A European coalition turned away an Ottoman army from Vienna again in 1683. Had it not been for narrow and timely victories, Europe would have been conquered in the name of Islam. ​It may be easy for us to look back on the Crusades with disgust. After all, this kind of warfare is something Christ himself would have denounced. It is also important to note that we cannot impose modern sensibilities upon those in Medieval times or apply an unfair double standard against the Crusaders. The Crusades were defensive efforts aiming to protect Christians from persecution and torture inflicted by invading Muslim armies that terrorized the area. Their efforts were well-intended, although their methods did not conform to the example set by Christ. Much worse could be said about their opponents.